Muscovy ducks are unusual Florida residents. They hiss instead of quack, they fly clumsily, and they somehow flourish in Florida’s urban environment. Native to Central and South America, they have lived in Florida for many years and can be found near lakes and canals statewide. The Muscovy duck is easily recognized by large patches of red, bumpy skin around their eyes and bill (females have smaller patches of red than males). Unfortunately, these very personable and intelligent animals are commonly harassed or worse by human residents of our state. ARFF is contacted on a regular basis by individuals and municipalities seeking a solution to “problems” with Muscovy ducks. Sometimes, their hissing is misinterpreted as aggression (in fact, they are very friendly animals). Most often, the complaints are that the ducks are “messy,” fouling golf courses or condominium walkways. It is difficult to imagine that bird droppings could warrant enough anger in people to drive them to attack the responsible animals. Sadly, Muscovy ducks in Florida have been kicked, chased with brooms, deliberately hit with vehicles, beaten to death and shot. Muscovy ducks, like all animals, are protected from harassment and inhumane killing under Florida’s anti-cruelty statute (828.12). Prosecutions of individuals causing pain, injury or death to ducks have occurred under the statute. Do Muscovy ducks carry disease? There is no evidence that Muscovy ducks transmit disease to humans, or otherwise pose a public-health threat. Trapping and relocation may sound like a good option, especially when disreputable trappers give only vague information about the ultimate destination of the animals. State law does not allow Muscovy ducks to be relocated to public lands (Captive Wildlife Regulation 372.265). The truth is that when ducks are removed by trappers, they will most likely be killed. Ducks who are not killed right away may be transported long distances in cramped cages to farms that will kill them for meat or exploit them for their eggs. The practice of trapping and removal can also injure animals. ARFF has received complaints about cruel trappers who only remove adult ducks, separating mothers from their offspring, leaving orphaned ducklings behind. In addition, trapping is expensive and ineffective as a long-term solution. 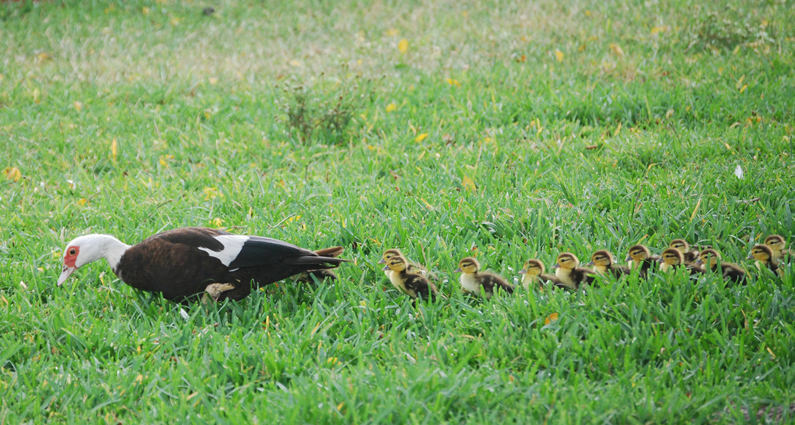 There are simple and effective ways of limiting populations of Muscovy ducks. The most humane way to reduce a duck population, or to keep Muscovy ducks from reaching “nuisance” numbers, is to remove newly-laid eggs. Egg collection can be a challenging process. Please contact ARFF for tips on how to properly collect eggs.